NASA's Juno spacecraft may have discovered another volcano on Jupiter's moon Io, adding to an already impressive list of known active volcanoes there. 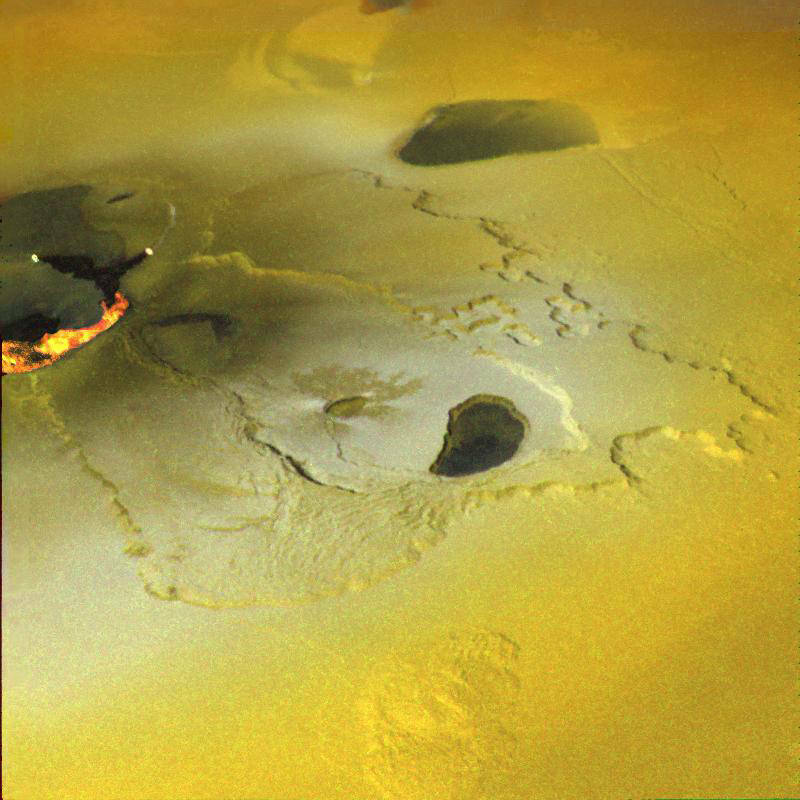 Since the Voyager spacecraft, and later Galileo, began collecting data in the Jupiter system in the 1970's and 1980's, about 150 active volcanoes have been spotted on Io. Scientists believe there may be as many as 250 more that remain undiscovered, and this latest hot-spot has scientists eagerly anticipating future, closer flybys of Io, a moon just slightly larger than Earth's own. 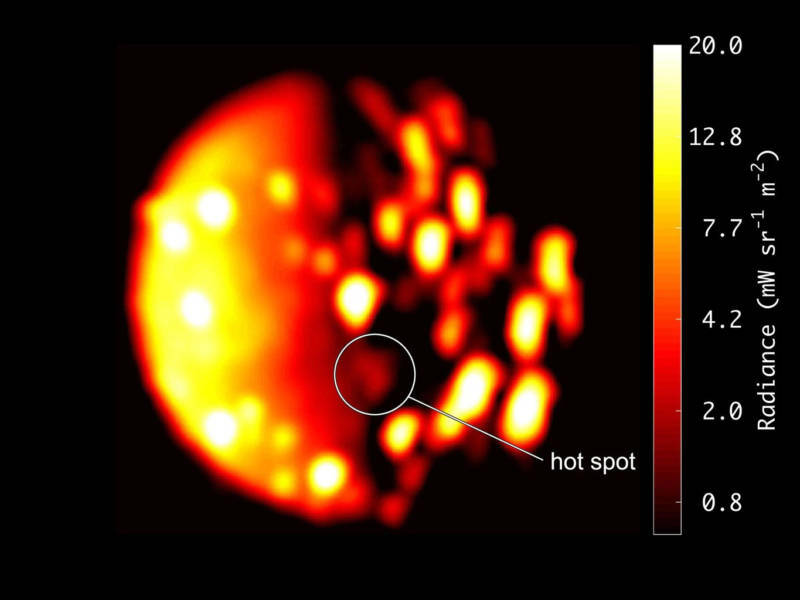 Data from Juno revealed the newest volcano as a previously undetected heat source near Io's southern pole. Juno collected the data last December, when the spacecraft passed within 290,000 miles of Io—a bit farther than the distance from Earth to our own moon. NASA's Juno mission is focused mainly on Jupiter, specifically to unveil the secrets of its little-understood polar region, as well as to probe its deep interior and even its core. Juno's Jovian InfraRed Auroral Mapper instrument was designed primarily to study the stunning light shows in Jupiter's atmosphere, known as auroras. They're caused by interactions of electrically charged particles from space. However, the heat-sensitive instrument also works very well in sensing heat from other things--in this case, volcanic eruptions on Io. 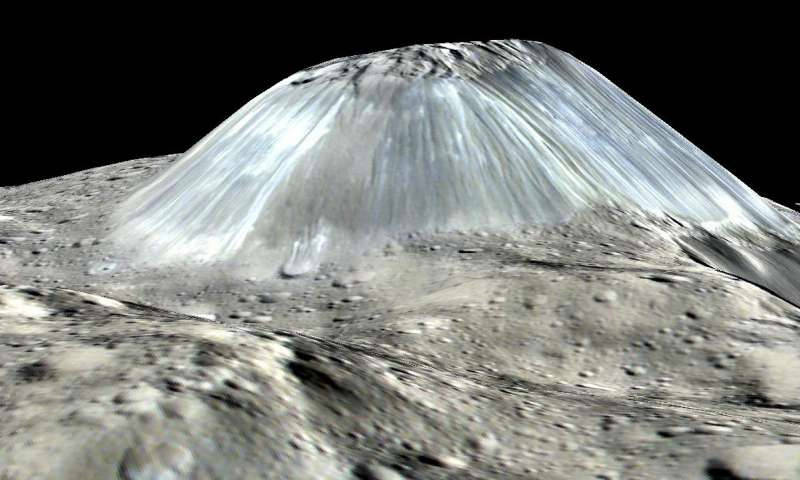 Why So Many Active Volcanoes on Such a Small Moon? Io's volcanic activity is driven by the same force that causes the tides in Earth's oceans: gravitational tidal energy. Earth's tides are driven by the pull of the moon and sun, which raise bulges in the ocean's waters. As Earth rotates, its surface moves into and out of these "bulge" regions, and people on the ground experience the rising and falling of the tide. Similarly, the powerful pull of Jupiter's gravity tugs at Io. Io has no oceans, so no swells of ocean water occur. But the tidal forces act to "stretch" Io itself into a slightly elongated sphere, its solid surface "bulging" all the same. 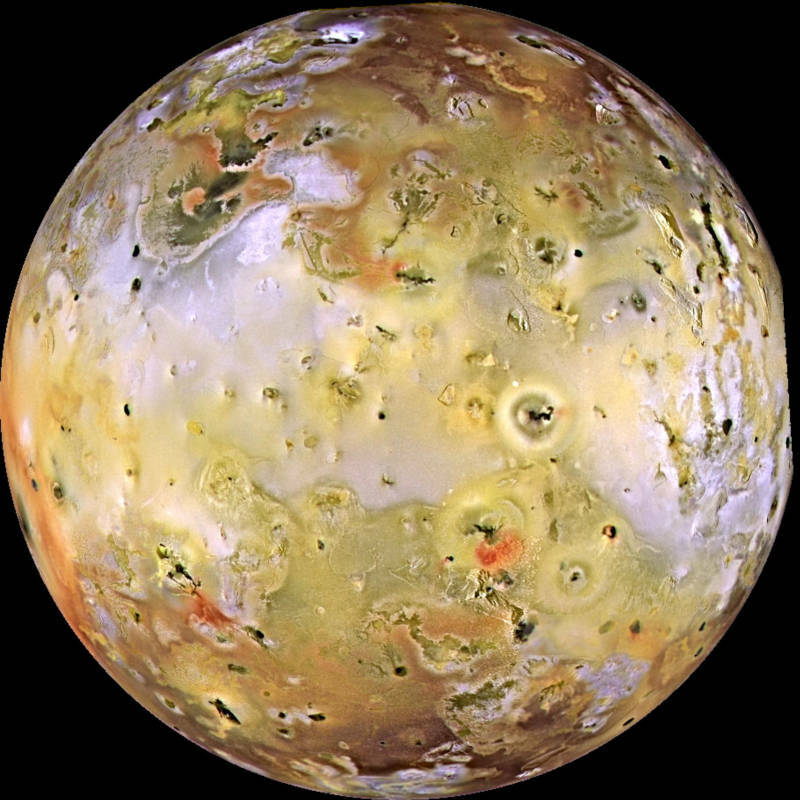 And while Earth's tidal ocean bulges amount to a range of only a couple of feet in open ocean (though usually greater near land due to geographical effects), Jupiter's powerful gravity stretches Io's surface over a range of 200 feet! As Io orbits, its elliptical path carries it closer to and farther from Jupiter, which changes the strength of the tidal pull and the amount of stretching. With each orbit, Io is stretched and then relaxed, and this continual stretch-relax-stretch-relax cycle produces frictional heat, warming up the interior. This is a bit like how you would squeeze and stretch a cold lump of playdough to warm it up and make it softer. 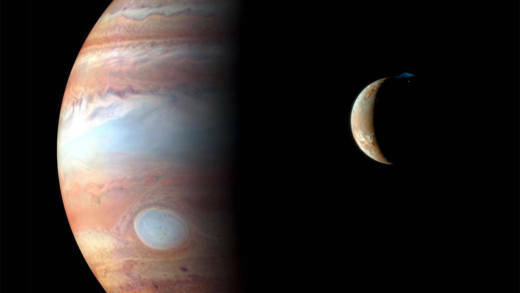 Io's internal heat source is potent enough to liquify materials into magma and drive volcanic eruptions at its surface. With potentially hundreds of volcanoes spewing out the sulfur-rich lava, Io's surface is a multicolor mottle of flows and deposits. Devoid of impact craters, Io sometimes appears like a big cheese pizza, or a moldy orange. 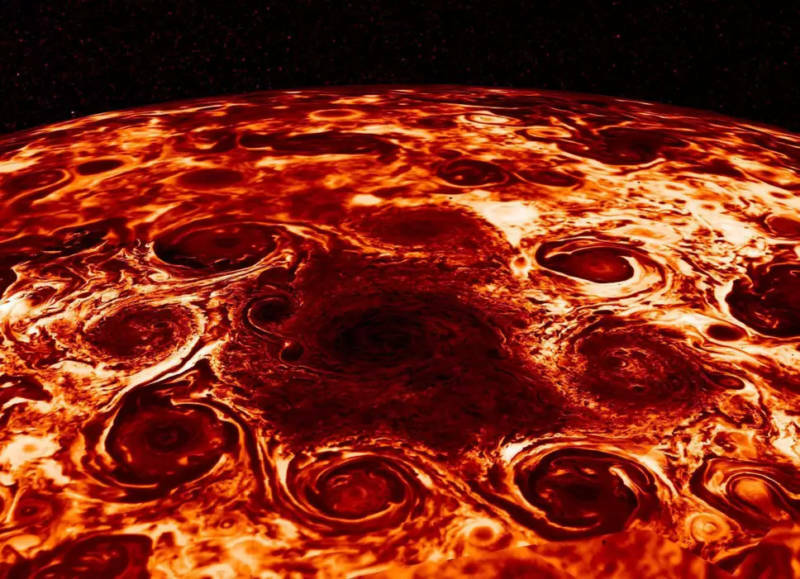 With visible and infrared cameras, Juno has captured stunning pictures of Jupiter's chaotic polar storms and atmospheric gyres, and by measuring Jupiter's magnetic and gravitational fields it has yielded clues to the gas giant's internal structure and fluid dynamics. Juno makes most of these observations during the brief intervals when it swings close to Jupiter on an elongated orbit, bringing the spacecraft to within 2,600 miles of Jupiter's cloud tops. The majority of each 53-day orbit is spent coasting much farther away, out to 5 million miles. This rollercoaster orbit is designed to protect Juno from the intense radiation belts close to Jupiter, allowing it to zip through the danger zone and then spend most of its time in safer realms farther away. Spending so much time far from Jupiter gives Juno scientists the opportunity to observe other objects in the Jupiter system, including Io and its entourage of volcanoes. Where Else In The Solar System Can You Find Active Volcanoes? Io and Earth are not the only objects in the solar system with active volcanoes. We know from observations by NASA's Magellan spacecraft that there may be active volcanoes on Venus, though this has not been confirmed. There are also objects in the solar system that show evidence of a type of volcano not found on Earth, a cryovolcano, some of which may even be active today. Cryovolcanoes, sometimes called "ice volcanoes," are similar to the hot volcanoes we are familiar with, but erupt with "cold" volatile liquids, like water, methane, and ammonia. In 1979, Voyager 2 detected nitrogen gas erupting from Neptune's moon, Triton. It also showed us that Triton's surface is young and is likely to have been shaped by tectonic activity and cryovolcanism. In 2005 the Cassini spacecraft detected water vapor and ammonia spewing from Saturn's moon Enceladus. Indirect evidence suggests cryovolcanic activity on Jupiter's moons Europa and Ganymede, Saturn's moon Titan, and Uranus' moon Miranda. Most recently, cryovolcanic activity has been detected on the dwarf planets Ceres and Pluto, as well as Pluto's moon, Charon. Juno's primary mission schedule would have sent the spacecraft to a self-disposing incineration in Jupiter's atmosphere in mid-September, but the good state of its health allowed mission managers to consider extending its tour of Jovian investigation and volcano-spotting moonlighting. Juno's mission has now been extended to July 2021, offering about 20 more close flybys of Jupiter, and potentially additional flybys of Io and its host of volcanoes.